What I love about this great reading community is discovering new authors. Elisa Gioia happens to fall in this category. When I first started reading romance books, I tended to stay away from love triangles and angsty story lines but as I continued to read more books in this particular genre, I find myself being drawn to stories with the angst. And in Elisa Gioia’s The Hook, Ms. Gioia has me hooked with this angsty romance love affair. How can one woman be hooked to two men? It’s simple, one man was from her past and another is now. But what happens when the ex from her past makes an appearance in her life and shakes things up that could disrupt her relationship with the man who truly sees her? Will this heroine be able to distinguish the love of then to the love of now? Is there ever such thing as uncomplicated love story? 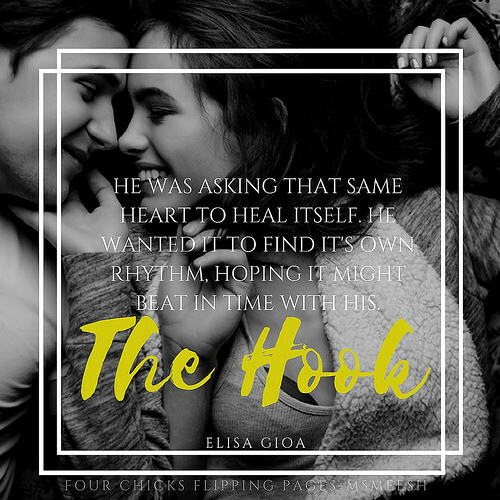 The Hook is one those stories that takes you on a journey that is filled with ups and downs. You will get frustrated at Gioia but at the same time understand her confusion and hesitation. Life is about making mistakes and learning from them and so Gioia will discover that love and life is all about taking a chance and finding the right person to get hooked on. Although, this book ends with somewhat a cliffy ending, the author leaves readers hopeful and satisfied for Gioia and her choice.